Of course, the time to put in a rainwater collection system would have been before the sprinklers and grass went in. We actually did meet with a rainwater guy back in December, but his business is focusing on bigger, commercial/municipal projects (and I'm pretty sure his price would have been on the order of $8-10k anyway). And thinking about the likely cost -- and the landscaping expenses that were ahead of us -- it didn't really make sense in light of current water rates (it would never, ever pay for itself). So we grudgingly let that idea fall to the wayside. A few things have happened since that time to change the calculus. A friend who is working on his own rainwater collection plan speculated about the cost of water in the future, and it was dismal. We also received our first two real water bills (including landscaping): $170 (for the month when the grass was brand new and we were watering nearly every day) and $70 (much more reasonable, but still $50 more than we're used to...and even though it takes a lot of $50s to add up to the thousands of dollars that even a DIY system would cost, the mere prospect of not "wasting" all that treated water on landscaping makes my heart feel all warm and fuzzy). Last, we have finished most of the landscaping and still have a decent chunk of our starting budget left (since we took on most of it ourselves). Yup, the area slated for the vegetable garden is the last major part of the yard that we still need to finish, and over the last few weeks, I have realized that it's not too late for a more limited rainwater collection system back there. Since that area is gravel, there's no grass to disturb if we were to trench to run underground rainwater lines. And since we didn't have any irrigation run to the two existing pomegranate trees -- they've done just fine the last two years with no water, so we didn't see the need -- there are no lines in that area, either. (The two pipes sticking up out of the gravel area come straight from under the grass and don't cross the rest of the gravel area.) So tying the back two gutters into a rainwater system would be relatively easy. 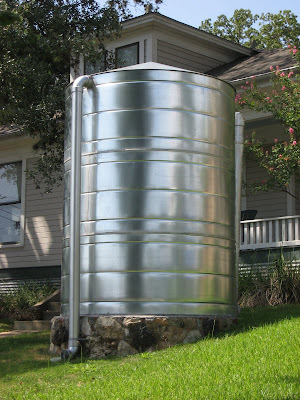 (Plus, while the system won't be tied into the irrigation system -- and certainly won't provide any water for indoor use -- having it near the vegetable garden will give us the opportunity to set the cistern up to provide water for the vegetable garden.) 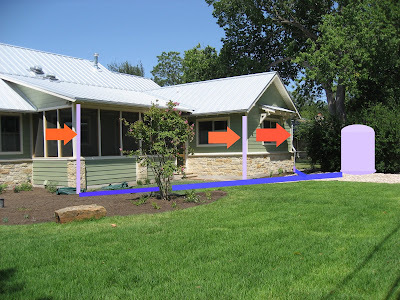 And as the idea unfolded, we realized that the gutter at the outside corner of the screened porch would be easy enough to run through the (currently patioless) back patio area and into the gravel area as well. Here's roughly how the plumbing would work. Each of the three back gutters would get watertight PVC downspouts (shown in the next picture with orange arrows) leading underground, where more PVC pipes (depicted in blue) would channel the water to the cistern (which would actually be a little farther back on the lot...work with me here). We will need to replace that with watertight PVC so that the water can flow down underground and, by gravity, fill up the cistern. 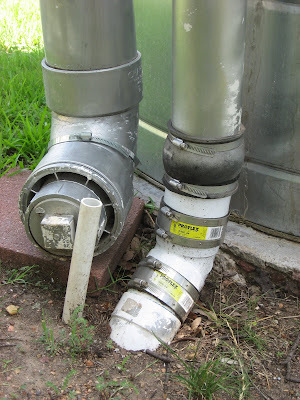 It's my understanding that the cap at the bottom of the first flush pipe isn't on quite tight, so that first, potentially icky water will gradually drain out to allow the process to happen all over again with the next rainfall. 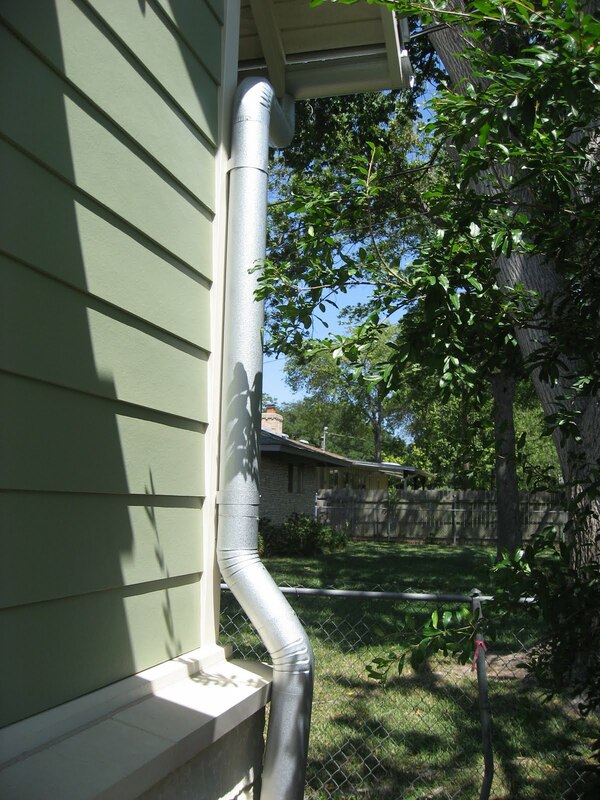 Once the first flush pipe is full, the rest of the water will flow into the cistern. 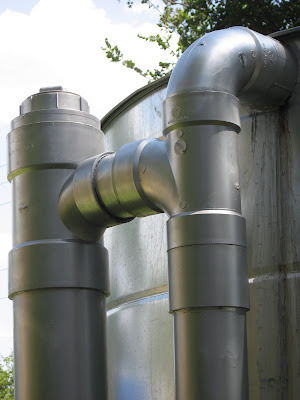 If the cistern gets full, a third pipe (shown below) leads that overflow gently down to the ground where it can be discharged wherever is most appropriate for the lot. We plan to order a cistern directly from the same local(ish) company where the one pictured above came from. We will then rent a trencher to dig the three trenches for the underground lines for each downspout (plus possibly a fourth from the front corner of the house, to leave open the possibility that we might want to tie that gutter into the system in the future). We will also run a piece of conduit in one of the trenches so that we can run an electrical line for a pump. Between all of that and other miscellaneous components, I know the cost will add up, but we should save at least half the cost of having a cistern installed by a professional. (Oh, and since we will likely need to remove the side fence -- the other side from the one we took out to bring in the bobcat -- to bring a good-sized cistern into the backyard, doing it ourselves will allow us to time the cistern project just right with the construction of a new fence (which we're also taking on ourselves). 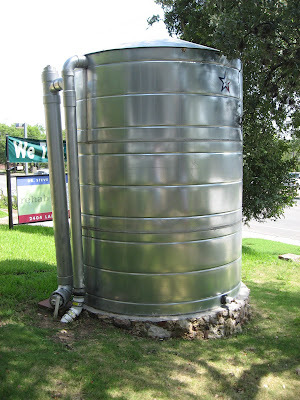 We still need to research the heck out rainwater collection system construction, permit issues, and the requirements for a rebate from the city (Austin offers rebates of $.50 to $1.00 per gallon for rainwater harvesting, so we want to be sure to do everything right to qualify for that). 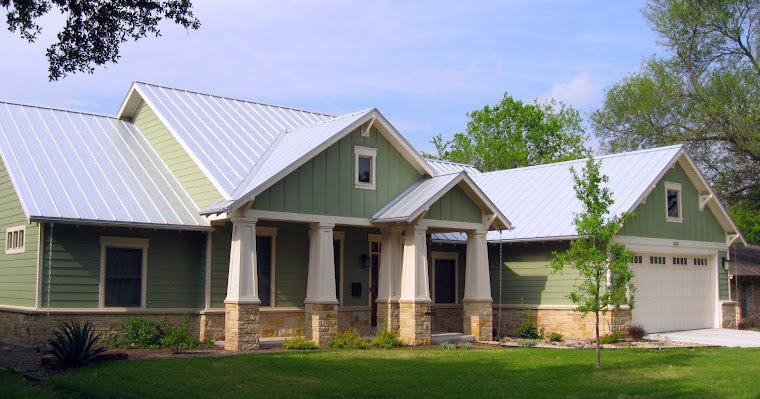 But we're pretty excited about the possibility of rounding out the Good Life by bringing that last major green component to this Green House.